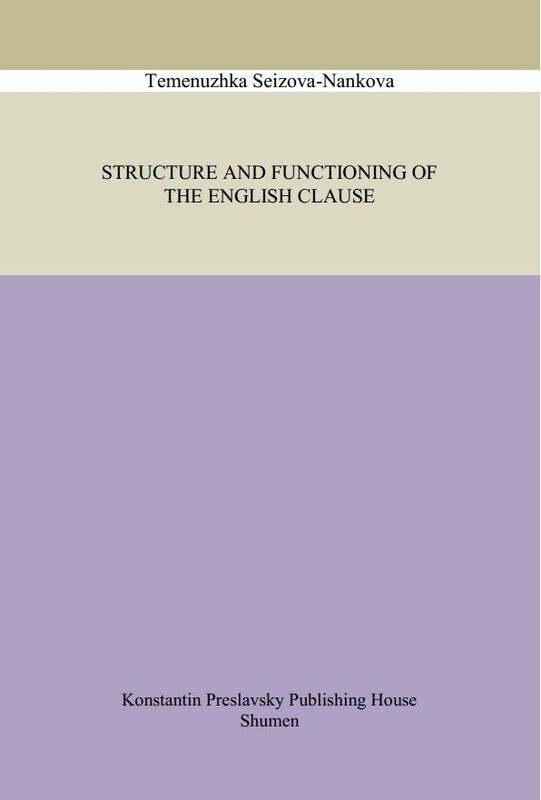 A pioneer work on the English clause basically based on the general framework of F. Daneš, the three-level approach to syntax, and concerned with the grammatical, semantic and FSP levels. These have been elaborated to highlight different aspects of the analysis of the sentence/clause/phrase. Structure is of primary concern among the interplay of factors. However, diverse points of view are considered for comparison. Special attention is drawn to the TMEs of the verb as they pose great problems to Bulgarian learners of English. Semantics is given due attention: basic notions are explained and mappings between syntax and semantics discussed. At the basis of considering the communicative aspect is the theory of FSP. One of its basic tenets among others is taking intonation as something of paramount importance when considering the English clause. This methodology helps students in their understanding of how the different facets of language shed light on the complexity of English as a lingua franca. The topic together with the framework of how to tackle it, can serve as a point of departure for further research of English word order (linear modification), especially in carrying out contrastive studies for which that manuscript forms a good basis. The book can be of interest to students, teachers of English, in fact, everybody interested in the language, no matter theoreticians or practitioners.